Let’s get down to what a lot of people won’t willingly share with you, the price. First, of course, we’ll start with the disclaimer. The prices are very specific to the builds as of the time of writing this (early November, 2014). They are always subject to change. The purpose of this article is not for you to use this as a price guarantee as I’m not qualified to give you that. If you’re interested in an exact price and are ready to purchase you can reach our World Class Internet Department at (800) 680-0835. Ask for our Internet Sales Manager, Drew Williams. The amounts below do not include your tax, tag, title, destination or other fees. They will only include any accessories or parts that the vehicle can be shipped to the store with from the factory. We’re only providing these price figures below so you have an idea what to expect before visiting your local dealership. Though I would encourage you to work with us no matter where you’re geographically located. If you’re more comfortable emailing you may also submit this form and let your Internet Representative know you’d prefer email or text communications. To completely cover our bases we’ll list the 3 standard disclaimers you’ll see even on Chevy’s website which is where we’re getting this information from. 1) MSRP less cash offers. Tax title, license and dealer fees extra. Take new retail delivery by 11/07/2014. Not available with lease, special finance and some other offers. See participating dealer for details. 2) MSRP excluding installation, taxes and wheel components (if applicable). Dealer prices may vary. Some accessories may require purchase of additional equipment and/or services. See your dealer for details. 3) MSRP excludes tax, title, license and dealer fees. See dealer for details. Now that that’s out of the way, let’s get down to it. What better place to start than the bottom? The entry level Colorado currently has an MSRP of $20,120 however with a standard Destination Freight Charge of $875 you can expect that you won’t be paying less than $20,995 for it. Your base model is actually called “Base” and is a step below the Work Truck or “WT”. It is Rear Wheel Drive. It has an Extended Cab and a Long Box bed. You’ll get a 2.5L I4 Direct Fuel Injection, Double Overhead Camshaft, Variable Valve Timing engine and a 6-speed manual transmission. Very few people would actually want to purchase this version even though it’s still a very reliable and efficient truck. The “mac-daddy Colorado” if you will, fully loaded with every option from the factory and accessory available and including the Destination Freight Charge will cost you right around $40,395. Of course, that one would be top-of-the-line Crew Cab, Long Box, Z71, 4WD with bed liners, full GearOn system, smoker accessories and everything else you could ever want in your Colorado. Again, very few people would want or need a truck decked out to the max like that one. So, if you’re looking for just a range of what the Colorado runs I suppose that would be from about $20,995 for the absolute base to $40,395 for the completely loaded, maxed out with all the bells and whistles. In this section we’re going to go ahead and just show you what the price points are for various trim levels (with just standard equipment), cab configurations and drive trains. We’ve already touched on the “Base” trim level but we’ll hit it here too. If you want to upgrade from 2 wheel drive to 4 wheel drive it’ll cost roughly $5,000. If you want to upgrade from Extended Cab to Crew Cab, Short Box it’ll cost roughly $2,000. 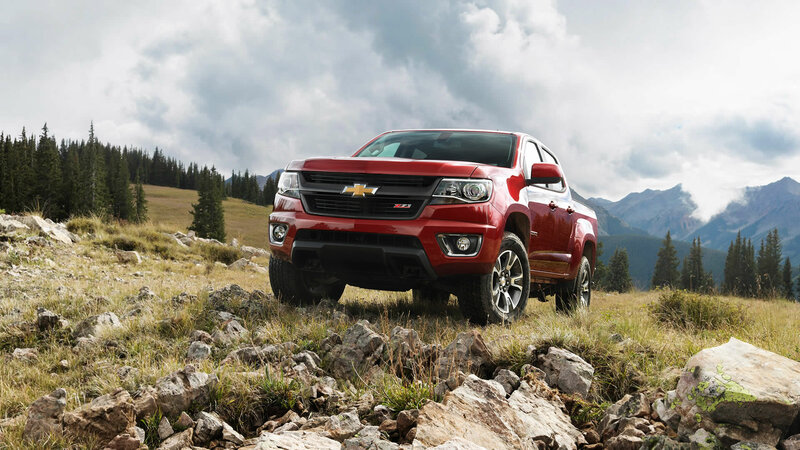 We hope that our 2015 Chevy Colorado Price Points was helpful to you!